As mentioned in our previous two blog entries, we’re featuring parts of an interview with Darryl Quinlan of MDidentity. This interview happened because we wanted to revisit the topic of a blog from last year – The Power of Reviews. Even though it had only been about a year, the prevalence of online reviews – and our reliance on them – has grown noticeably to say the least. As the Product Manager of MDidentity, Quinlan is truly qualified to discuss not only the world of reviews, but also the strategies a business owner, practice manager, or doctor can put into place to grow and maintain a healthy reputation and public image. I like to think I asked him insightful questions, but honestly, this interview probably would have been just as rewarding if I had only said, “online reviews… ready, set, go!” because Quinlan can’t help but get to the heart of the matter while still illustrating the connections to the bigger picture. If you are at all interested in learning more about creating a strategy for your online reputation, I don’t hesitate recommending that you contact Darryl Quinlan. I asked Quinlan if he’s seeing any trends or commonalities when it comes to the complaints found in negative reviews. He immediately said “wait times” without having to consider the answer. Long wait times can happen for a number of reasons; often they’re due to a good doctor taking the time to answer all of a patient’s questions thoroughly and thoughtfully. Since that extra time is seldom built in to the appointments, the special attention one patient needs will have a big effect on the patients scheduled for later in the day. “So wait time is the biggest issue that practices have,” Quinlan explained. “And how a practice responds to it can be very telling.” He spoke very frankly about this. 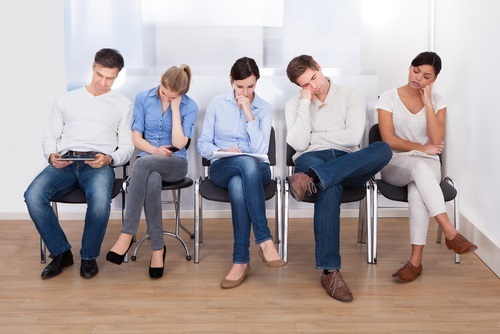 I know of one practice where the wait time is killing the person who runs the practice, because the doctors want to get in as many people as they can – they don’t care about wait times, they just look at how many patients they saw in a day. Slowly over the past few years, their reputation has been spreading as a horrible place to go. Not because the doctors are incompetent, but because you wait for four hours to get your appointment if you’re in the latter half of the day. And the doctors don’t care. So over time, and it’s been a slow trickle, this practice’s volume has dropped off more and more because this information is constant. Looking through their reviews on different sites, it’s the same thing over and over again. And the doctors won’t address it as an issue; they won’t try to fix it because it would mean less money in their pockets right now. But what they’re not realizing is that two or three years down the road, there will be no money coming in because nobody will want to go there. It helps search engine optimization because it’s content. That’s one of the things MDidentity does – the reviews you select will get funneled onto a subpage that indexes so as you get more reviews that’s more fresh content which search engines like, so it’s important for SEO. But it’s more important that you’re controlling the message when people are in that research phase. If you google “Thomas Eye Group reviews” the first result is a not a Yelp profile, not a Google profile, it’s their own subpage. It’s something the practice themselves control, it indexes incredibly high, with their positive message and all of this wonderful information. The unfortunate thing, and people tend to balk at this, is that you have to control your own reputation. You do have to do things like factor out one and two star reviews when you’re putting your best foot forward. “But I’m manipulating my reputation!” Yes! Of course you are! That’s what reputation management is: putting your best foot forward. You want people to be happy all the time, but that isn’t going to happen. And if you have a bad reputation, you have to build up plenty of happy people before you can actually put the bad aside. In the long run, it isn’t just easier but also saves time, money, and headaches.